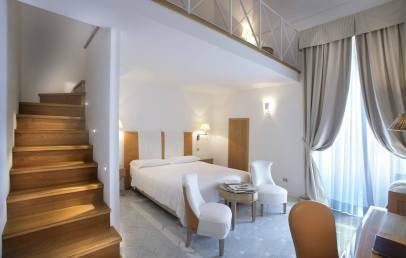 boutique hotel of 14 rooms, characterized by a classy and elegant style in its more ancient area, while the new side features modern and trendy details. Not to be missed – the stunning view of Gallipoli from the panoramic terrace of the hotel. 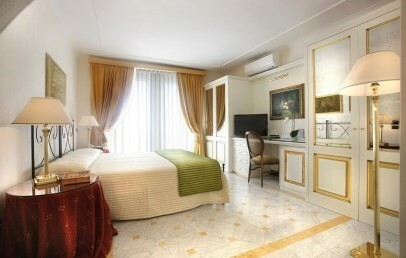 The hotel Palazzo del Corso is located in Corso Roma, the high street in Gallipoli, a few steps away from the old town. Gallipoli, in the province of Lecce, the main city of Salento, is located exactly in the bootheel of Italy of the Italian peninsula. Given its proximity to the beach, it is possible to walk to some lidos on the coast. Brindisi airport is about 60 km away from the hotel. Charming suggests you to rent a car to reach better the hotel. This historic builiding of Palazzo del Corso dates back to the 18th century and has been turned into a 5 star luxury hotel. It provides all the comforts without changing its original architectural structure. The Palazzo del Corso astonishes us with its beautiful frescos, the stucco and the features in leccese stone dating back to the year 1800. From May to September, guests can enjoy the breathtaking view of the gulf, bathe in the Jacuzzi, relax in the solarium, taste the delicious breakfast or exquisite plates from dinner buffet menu. Morover the hotel has a private beach area, a private parking and reading/TV room. 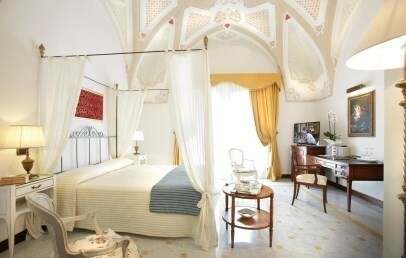 Palazzo del Corso has different room types as Classic, Fashion, Prestige, Grand Suite e Glamour. 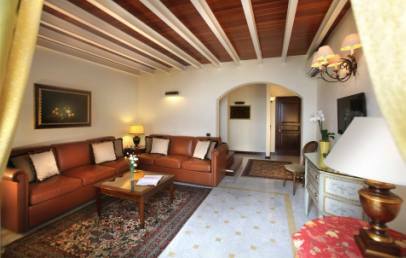 All are furnished with loving care in every detail with bright colours and have a glazed door with a small balcony. They have either a desk or a relax area and are equipped with modern comforts as LCD television with satellite channels, mini bar, air conditioning with automatic temperature electronic control, safety box and complimentary internet Wi-Fi connection. The Suites have two levels where day and night zone are separated. Guests have free Wi-Fi internet access, can use the gym equipped with Technogym equipments and the pool on the panoramic "Roof Garden". The hotel offers a lunch "light lunch" for € 20 per person and the opportunity to dine at the hotel with a supplement of € 45 per person, these supplements are to pay on-site (beverages excluded). City tax – € 2,00 per person, per overnight. Valid for everyone above 16 years and valid for a maximum of 7 consecutive nights. The tax is to pay directly on-site. 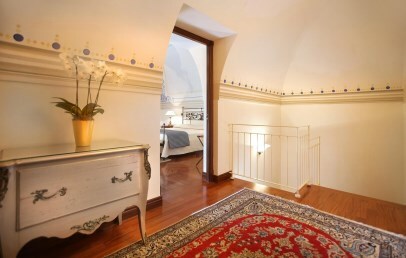 Double rooms in the recently refurbished Provenzano Palace. 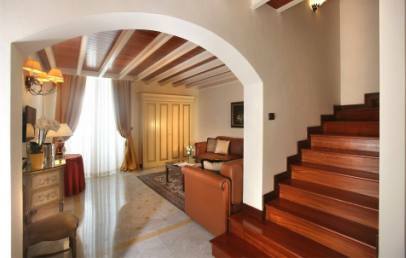 All room are finely furnished and all have white marbles and a fine contemporary set of wood and leather décor. 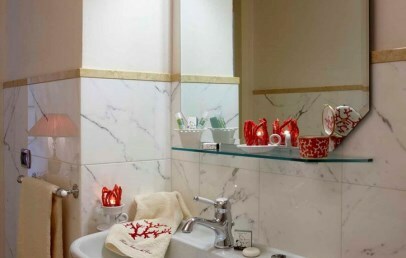 The bathroom is in marble and is complete with shower, hairdryer, courtesy set, slippers and bathrobes. All rooms have wide windows and some of them a French window with small balcony. Romantic rooms in the Ravenna Palace. 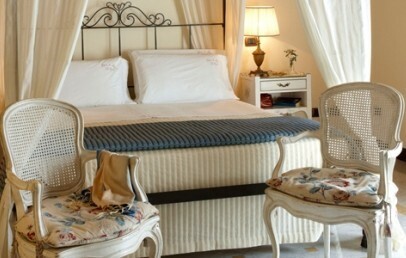 All rooms are provided with leather furnishing and carparo marble and Leccese stone decorations, or alternatively wonderful classic style frescoes. 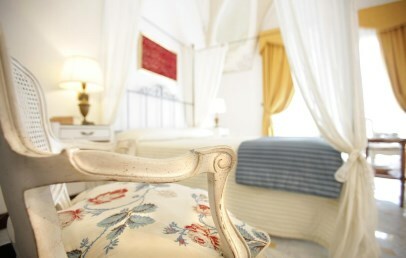 All rooms have a romantic canopy bed. The bathrooms comes with shower, hairdryer, courtesy set, slippers and bathrobes. 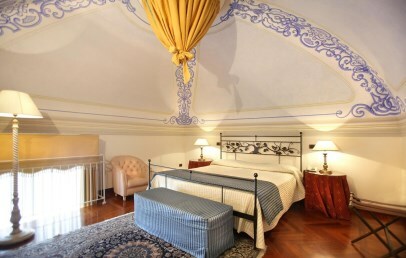 Two levels luxury suites in the Ravenna Palace decorated with original frescoes, perfect for the most demanding clients. All rooms include a big bed, two bathrooms with shower, courtesy set, soft bathrobes and slippers. They all have a balcony with a dramatic view of the sea. The bright and modern Glamour Suite is distributed on two levels. On the entrance level there is the double bed, the bathroom with shower and tub, hairdryer, slippers, bathrobes and a little balcony offering a nice sea view. 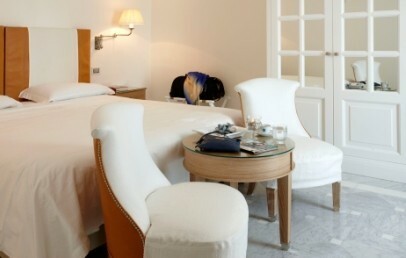 The furnishing is in a contemporary style with white marble and exquisite furnishings of leather and wood. On the upper floor is the possibility to add one or two beds. The specialness of this Glamour Suite is the color therapy function, which is located above the double bed. 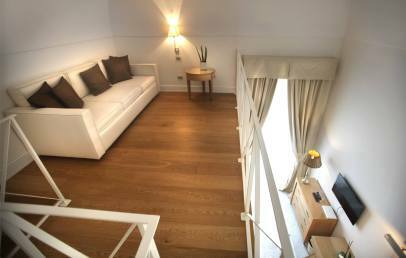 Double rooms in the recently refurbished Palazzo Ravenna. 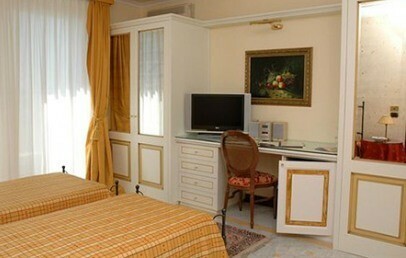 All room are finely furnished in a classic style and with white marbles. 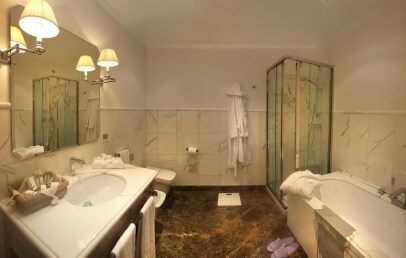 The bathroom is in marble and is complete with shower, hairdryer, courtesy set, slippers and bathrobes. All rooms have a glazed door with small balcony. Only for Charming customers: 10% reduction on massages and beauty treatments!